This article originally appeared in the December, 2012 issue of Hemming’s Classic Car. It was an era of unbridled, machine-driven technical advancement, of optimism in the limitless possibility that the future held. Automobiles, like many other products designed and sold from the late 1920s through the early 1940s, reflected all this potential. In spite of the Great Depression, or perhaps because of it, that optimism was translated not only into luxury goods for the well-heeled few, but for the first time into mass-produced, popular-priced consumer products that reflected the vibrant promise of modernity and speed. Some brave and revolutionary cars paid tribute to the zeitgeist with their overall design concepts, but most showed their Machine Age influence in small ways, in subtle and glorious details. From their earliest days in the late nineteenth century, automobiles were assemblages of parts, functional machines whose form was secondary to their purpose; design meant solely the cloaking of the mechanical components that were usually only fathomable by specialized mechanics, chauffeurs and dedicated enthusiasts. Epitomizing the reign of function over form, millions of inexpensive, no-frills Ford Model Ts democratized American personal transportation during that car's 19-year tenure, making it so that any housewife could drive to the store, any farmer with hand tools and horse sense could keep it running. Huge numbers of paved roads and bridges were built to support this increase in traffic and road speeds. It wasn't until the prosperous mid- to late 1920s that, like the electrified home, the radio set, the wired-in telephone and the moving picture, cars had become so ubiquitous and user-friendly that they were accepted as a normal part of everyday life, approachable by people of almost every socio-economic status. For those who could afford a bit more than the basics, cars had become more than mere transportation--they were freedom, they were a highly visible means of expression, they represented the power of personal choice. And the automobile's aforementioned new roles corresponded with exciting new themes sweeping art and design. The Art Deco movement, as it would come to be known in the late 1960s, originated in France as a reaction to the florid excesses of Art Nouveau. It was Paris's 1925 Exposition Internationale des Arts Décoratifs et Industriels Modernes (International Exhibit of Decorative Arts and Modern Industries) event that brought this decorative arts movement, then termed "Style moderne," to the world's stage. In its original form, Art Deco was primarily seen in high-end luxury crafts where rich, saturated colours and detailed, decorative, sharp geometric patterns--including zigzags, chevrons, sun rays and stylized foliage--dominated. There was an emphasis on vertical shapes, and the colour and texture variations of contrasting materials--including machined metal, enamel, ivory, glass and exotic woods--were typically used as elements of design. Functional jewellery, furniture and lighting and textiles could exhibit Art Deco ornamentation within a home, while the building itself could do the same, with a simple form, flat roof, stepped-in upper stories and geometric details: The most famous American example of a building decorated with Art Deco design motifs--and, not coincidentally, one with an automotive theme as well--is New York City's striking Chrysler Building, dating from 1930. The influences of this vivacious movement in 1930s America would gradually be tempered with, and then replaced by, those of the related Streamline (to the art world, Art) Moderne. Using the pared-down austerity of the Great Depression to its advantage and celebrating the machine-made, this home-grown design theme tapped into the general sense of progress that arrived with newly practical and accessible transportation forms like the metal fuselage-bodied airplane, the sleek Zeppelin, the high-performance automobile and the luxurious ocean liner. Also influential were new industrial, scientific and communication machines that, for the average consumer, created a desire for greater efficiency, dynamism and speed. "Unlike the ideals of machine purity and modernism, the streamlined object had few parts and was not a geometrical form; rather, it was aerodynamically contoured, with the ultimate shape resembling a teardrop," wrote Richard Guy Wilson in The Machine Age In America 1918-1941, referring to this new design theme. "The concept of machine motion changed from an almost primitive rhythm of watch gears turning to a new, smooth, constantly accelerating motion." 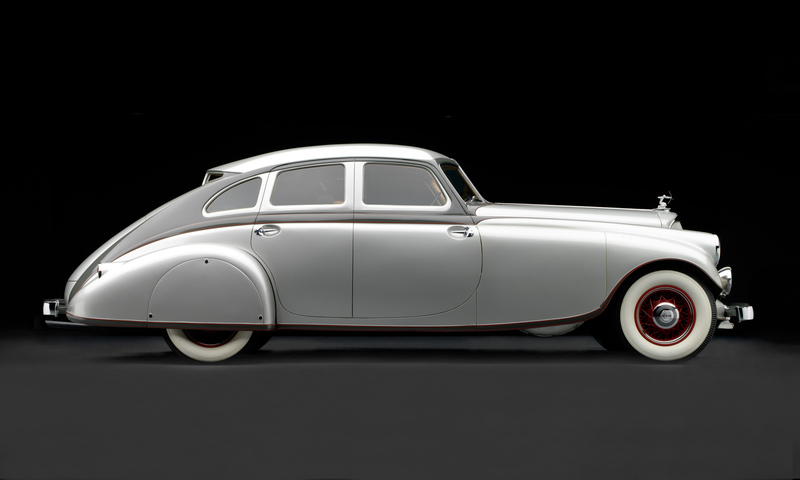 Representing this aerodynamic efficiency and speed in design form were Streamline Moderne's smoothly curved aesthetics; spare, horizontal "speed lines;" and careful symmetry. The look was promoted in a 1932 book, Horizons, by commercial/industrial artist Norman Bel Geddes, and as had happened as a result of the 1925 Paris exposition, this visual trend found widespread popularity after being highlighted at the 1933-'34 "Century of Progress" Chicago World's Fair. Replacing the tight control, ornate decoration and bold colours of Deco were sleek forms, neutral and pastel colours and metallic accents; new materials like Bakelite plastic, Vitrioled opaque glass and Formica, as well as technical materials like engine-turned and polished aluminium, brushed stainless steel and glossy enamel, were favoured. Even more so than had Art Deco, the Streamline Moderne style found its way into virtually every aspect of Americans' lives. Visual appeal was key in selling new mass-produced merchandise that stood out among the millions of other examples that were introduced during the Depression, and product designers and commercial/industrial artists like Bel Geddes, Raymond Loewy and Walter Dorwin Teague ensured that modern home conveniences--refrigerators and tabletop fans, radios and clocks, electric kettles and vacuum cleaners--exhibited the aeronautical-influenced style. Architecture even came to adopt Streamline Moderne trends, adding curved corners to bold, flat-roofed structures that could be trimmed in steel panels or glass, with horizontal elements. And of course, American cars reflected this as well. Considering how intertwined automobiles and the conceptual Utopia of technical advancement were, it's not surprising how thoroughly these almost universal design movements influenced automotive styling, inside and out, in the years between the wars. 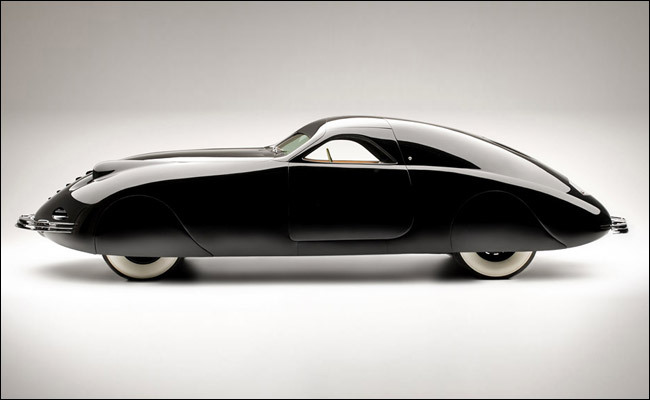 While cars continued to be constructed from sheet steel, iron, pot metal, wood, leather and wool, they began to reflect a newfound sense of style that had originated with high-end custom body builders, and were influenced by the shapes, colours and flourishes appearing at European concours d'elegance. 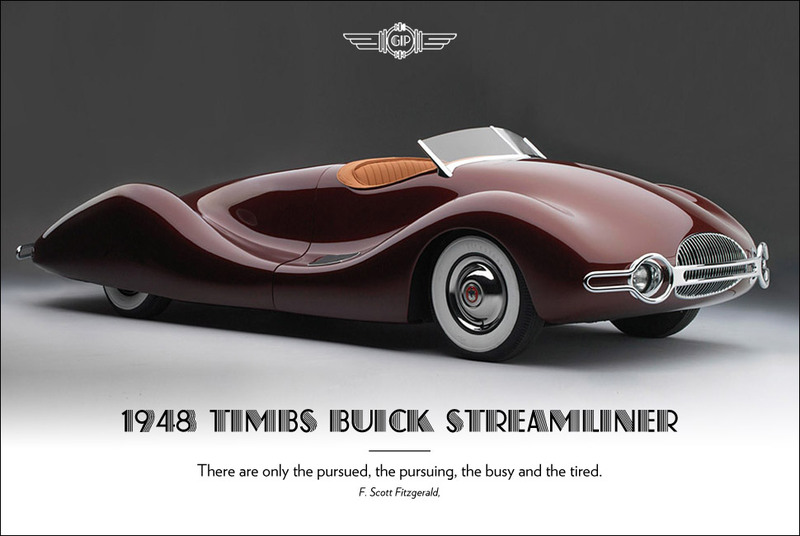 And while scientific-minded designers like Paul Jaray and Hans Ledwinka created polarizing postmodern aerodynamic automotive concepts in Europe (Buckminster Fuller was their American counterpart with his Dymaxion), U.S.-based independent industrial designers made streamlined automotive design palatable, and indeed desirable, to the masses. "Industrial design, as it emerged in the early 1930s, did not have clear boundaries; it encompassed furniture and architecture as well as duplicating machines and cars," wrote Richard Guy Wilson. "The American public had spread before it a cornucopia of consumer goods. Ordinary, everyday products intended for the home, the office, the factory or the road were made into objects of art. Industrial design meant both design for industry and design for consumption. In this way, modern design and the machine entered the popular consciousness and became acceptable." Styling, as we know it in the cars of today, was evolving in the late 1920s. Gifted Murray Corporation automotive stylist Amos E. Northup wrote, in his "Motor-Car Design of the Future" essay in the December 1928 issue of Auto body, "I sincerely believe that by closer cooperation between motor-car designer and chassis engineer, our future cars will each have more of an individual appearance than at present, when at a certain distance, it is difficult to distinguish their identity." Decades of refinement and user-friendliness had taken away the car's mechanical mystique, and he notes, "Performance is established; it is a prerequisite... Every salesman is aware that today his sales efforts and sales talk must be directed along the line of beauty and comfort." In the world of mass-produced, popular-priced automobiles, General Motors led the design revolution with two major contributions. They instituted the annual model styling change, fostering the as-yet-undefined term of planned obsolescence. And they hired Harley Earl, a youthful Los Angeles-based designer with a background in custom car body building, creating around him the Art and Colour Section, and allowing the fresh language that defined his popular Hispano-Suiza-inspired 1927 La Salle to influence the cars of other GM divisions. Thoughtful use of colour and eye-catching lines and detailing were now selling points, and other American automakers soon followed in GM's footsteps: Edsel Ford hired yacht designer Eugene "Bob" Gregorie, who created unique projects like the 1934 Special Speedster and 1936 Continental, while also shepherding John Tjaarda's advanced rear-engine 1933 Briggs concept into the lauded 1936 Lincoln-Zephyr; Chrysler's research head Carl Breer, vice president of engineering Fred Zeder, chassis engineer Owen Skelton and research engineer George McCain, along with art department head H.V. Henderson, created the daring, seminal 1934 Airflow; Raymond Loewy brought streamlined modern style to Studebaker and the Hupp Motor Company; and Graham, Marmon, Reo and other independents set styling trends in the early 1930s due to the genius of the aforementioned Northup. Being conscious of trends in art, colour, fashion, typography and much more allowed these engineers and designers to infuse American cars of the late 1920s, the 1930s and the early 1940s with an evolution of styling cues that deeply reflected the spirit of their eras. Cars had already transcended pure function and become the ultimate personal accessories, desirable for their design as much as for their speed, luxury and practicality. From their exterior body design and bright trim, radiator grilles and hood ornaments to their dashboards, instrumentation, interior panels and even seats, cars of every price range and body style soon spoke volumes about their owners' taste and their parent company's engineering bravado. And when automobile production resumed after World War II, the world was a different place, with a new sense of the awesome (as well as awful) power of machines; automotive design would soon take a different path, leaving the cars and cues of this late inter-war period unique and forever celebrated.